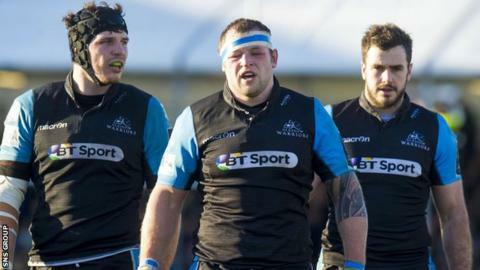 Head coach Gregor Townsend believes Glasgow will reach the European Champions Cup quarter-finals with a victory at Bath on Sunday. Warriors are third in Pool 4 going into the final round of fixtures, one point behind Bath and two adrift of leaders Toulouse. The five group winners progress, along with the three best runners-up. "I think a win for either team will probably put them through," Townsend told BBC Scotland. Victory would be enough to top the section if Montpellier can break their duck in the competition at home to Toulouse. Glasgow had to work hard for a 21-10 home win against Montpellier last weekend, while four-time European champions Toulouse suffered their first loss in the group, going down 35-18 to Bath at the Stade Ernest-Wallon. "Toulouse have to go to Montpellier and they played really well against us and I believe they are going to put out their strongest team, so that's a tough one," added Townsend. "The fact we are playing on Sunday means we'll have a much better picture of what we need to do, whether it's a win or a win with a bonus point. "There is only one set of pool matches to follow ours. But we know this is knockout rugby and if we lose we're out." Townsend was frustrated not to pick up a bonus point at home to Montpellier but can take heart from a thumping 37-10 win over Bath at Scotstoun on the opening weekend of the competition. "Like always, we need to improve from the week before and there are a couple of things we need to put right," he told BBC Scotland. "We also need to look at our opponents, how we beat them last time, where their threats are - they are stronger than when we played them last time. "It's been a thorough week of preparation and the work the players and coaches have put in has been fantastic. "There is a lot of excitement. Bath is an iconic venue and you are playing against some of the best players in the game." Bath winning in Toulouse has set up a tense finale but Townsend was not entirely surprised by the result. "They have been playing well for the last couple of months - they are second top of the Premiership - and they had nothing to lose over there," he added. "They played some fantastic rugby. To break down Toulouse so quickly was something I maybe didn't expect. "But if you let Bath play they have some of the best runners in the game and Toulouse did that one or two times too many. "They will run the ball from anywhere, they have a strong set-piece and they will be full of confidence. "We know we're facing a team that will put everything into the game. This is their opportunity to get into the quarter-finals. We're up against quality players - there are a huge number of Bath players in the England squad, either the senior side or Saxons. "We know what we're up against. We know they will play well and we have to bring our best game to match that."